Our new giveaway is for Auslogics BoostSpeed 8 for which we offer 10 license keys, each one worth $60 USD, valid for 1 year/1PC. Auslogics BoostSpeed comes with a 7 year presence on the market, highly awarded, from a reputable Australian developer. How to win a license: Simply leave a comment below. We'd also like to know: What are you currently using for your PC maintenance? Not sure you want it? Download the trial first. (Optional) Show your support for the author by following Auslogics on Facebook and Twitter. The giveaway ends on Thursday, September 17. We'll pick 10 winners via random.org and announce each one via email so, if you don't have a Download3k account already, make sure you use a valid email during registration. Don't forget to send your friends and colleagues over here as well. Congratulations and thank you all for taking part in our giveaway. 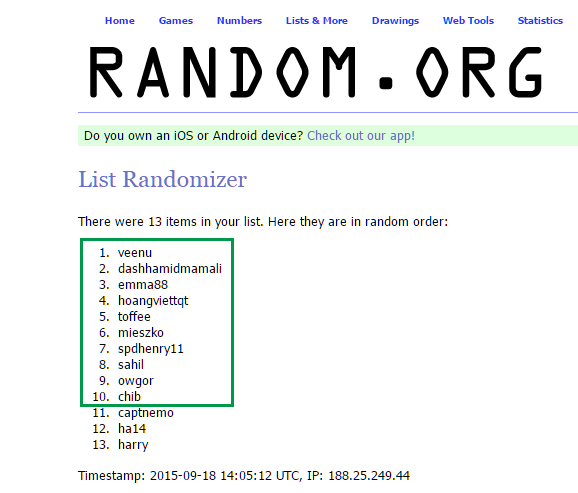 Here's a screenshot of the draw as well. Future giveaways will be announced on Twitter, Facebook, Google+, or in the Newsletter. I received the key! Thank you! Congratulations to the winners and thank you all for taking part in this giveaway. We've sent emails to all 10 winners. If you run into problems, don't hesitate to write back. Thanks for giveaway hope im not to late to enter, just back from holidays. Thank you for the "giveaway"
I'll talk to my friends about "Bootspeed 8"
Up to now I was using AVS Registry Cleaner. Currently using the CCleaner. Hope i win this Auslogics Boostspeed giveaway. Thanks for the Auslogics Boostspeed giveaway. thanks for Auslogics BoostSpeed 8 contest, it has a good reputation in cleaning Windows.